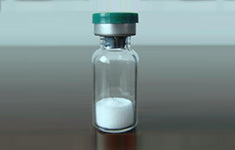 GHRP-6 (Growth Hormone Releasing Peptide – 6) is a true hGH secretagogue. Which means it stimulates the body's own secretion of hGH. Human Growth hormone has been shown in studies to promote lean body mass and reduce adiposity (fat). GHRP 6 also has a protective effect on the liver and an anti-inflammatory effect. These are paramount attributes for experiments involving muscle synthesis and recovery.